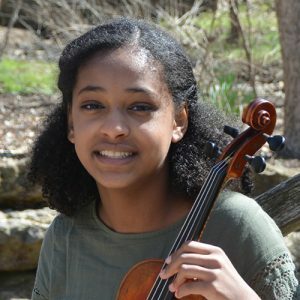 Bethlehem (Betti) Kelley is an Ethiopian-American violinist in the tenth-grade who resides in Johnson County. Betti studies with Kansas City Symphony Violinist Kristin Velicer. Prior that she studied with Alice Joy Lewis at Ottawa Suzuki Strings for eight years. One of Betti’s most cherished musical experiences has been attending the full scholarship Sphinx Performance Academy in the summers of 2015-2017. Last summer she also attended the highly competitive NYO2 Orchestral Program at Carnegie Hall, again on full scholarship, and she will return there in the summer of 2018. Locally, Betti plays in the Youth Symphony of Kansas City. A proud member of Jack and Jill of America since age three, Betti spends time throughout the school year on leadership activities and community service projects in the Kansas City area. Betti’s favorite subjects in school are math and science. Her hobbies include reading and playing with her cat and dog.